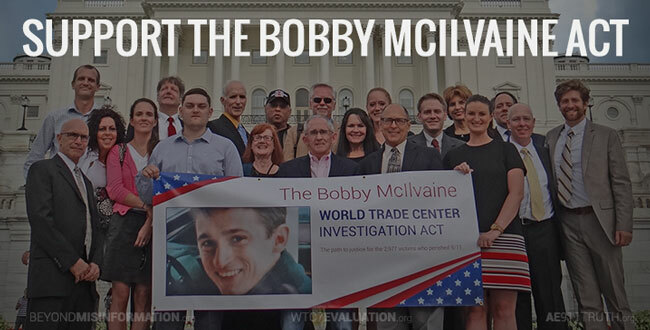 On March 1st, we at AE911Truth will be sending a letter to Boston-area members of Congress Stephen Lynch, Michael Capuano, and Katherine Clark, urging them to introduce the Bobby McIlvaine World Trade Center Investigation Act. We’re asking you to sign this letter so that together we can send a strong message to your legislators that architects and engineers in the Boston area support a new investigation of the World Trade Center’s destruction. Please take one minute right now to read this one-page letter and then “REPLY” to this email if you would like to add your name. We’re approaching these three representatives for two reasons: (1) There are many of us in the Boston area who support a new WTC investigation, and (2) each of these representatives demonstrated their commitment to 9/11 transparency, truth, and justice when they sponsored House Resolution 14, which called on President Obama to declassify the 28 pages that were redacted from the Joint Congressional Inquiry into 9/11. 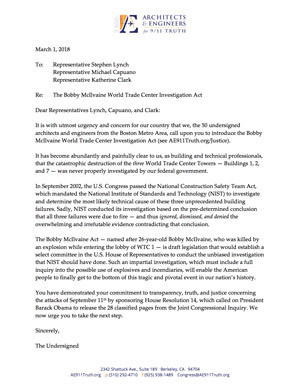 Sending a letter from all of us to the three of them is a sure way to get their attention and assure them that building and technical professionals will stand behind them if they courageously sponsor the Bobby McIlvaine Act. Our goal is to have at least 50 signatories. We need you onboard in order to reach that goal. Please join us.